Molds are fungi. Molds grow throughout the natural and build environment. Tiny particles of mold are present in indoor and outdoor air. In nature, molds help break down dead materials and can be found growing on soil, foods, plant matter, and other items. Molds produce microscopic cells called "spores" which are very tiny and spread easily through the air. Live spores act like seeds, forming new mold growths (colonies) when they find the right conditions. Mold only needs a few simple things to grow and multiply: moisture, nutrients, and suitable place to grow. Of these, controlling excess moisture is the key to preventing and stopping indoor mold growth. Should I be concerned about mold in my home? Mold should not be permitted to grow and multiply indoors. When this happens, health problems can occur and building materials, goods and furnishings may be damaged. Look for signs of excess moisture or water damage. Look for water leaks, standing water, water stains, and condensation problems. For example, do you see any watermarks or discoloration on walls ceilings, carpet, woodwork or other building materials? It is important to make sure that the source of the moisture is stopped before the mold is cleaned up. If this is not done, the mold will grow again. 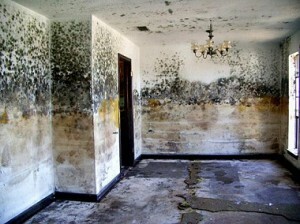 How you clean up the areas contaminated with mold depends on the surface where the mold is growing. A professional should be consulted if large areas (more than 30 square feet) are contaminated with mold. If the surface is non-porous (varnished wood, tile, etc. ), you can take the following steps. The surface first needs to be cleaned with soap. The next step is to disinfect the surfaces to help prevent the mold from coming back. Disinfect the area with a solution of water and bleach (1/2 cup of bleach per gallon of water). Straight bleach will not be more effective. When mixing or using the solution, make sure the windows are open. Let disinfected areas dry naturally. This extended time is important to kill all the mold. Click here for a list of mold remediation specialists in your area.